Unlike a traditional myomectomy, a hysteroscopic myomectomy is a non-invasive treatment for fibroids! Learn more. Nearly 70% of women experience uterine fibroids, which are noncancerous tumors found in the uterus. Symptoms include heavy menstrual bleeding, an enlarged uterus that can resemble early pregnancy, and pelvic pressure or pain. Most women will endure these symptoms caused by fibroids until they reach menopause or opt for a hysterectomy (removal of the uterus). A non-invasive procedure, hysteroscopic myomectomy (not to be confused with a traditional myomectomy) can remove the fibroid while preserving the uterus. Unlike the traditional myomectomy procedure that removes fibroids via an incision in the abdomen, a hysteroscopic myomectomy removes fibroids without surgery, inserting an instrument through the cervix with a camera attached to locate the fibroid, cut it into small pieces, and then easily remove it from the uterus. Fibroid Treatment Collective founder, Dr. Bruce McLucas, has recently conducted a research study determining the advantages of having a hysteroscopic myomectomy procedure after receiving Uterine Artery Embolization (UAE), which is another non-invasive procedure that inhibits the blood source to the tumor. The data revealed that having this concurrent procedure can benefit patients by reducing blood loss and hospital stay. It should be noted that not all patients are able to undergo a hysteroscopic myomectomy. The location of the fibroid plays a role in determining the best course of action for the patient. There are options for women living with fibroids that does not include a hysterectomy. 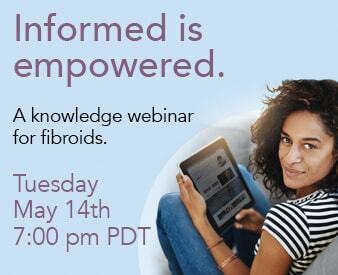 Talk to your doctor to get all of the information on treatment options for fibroids.